Who could have foretold that 1,001 days after the vote was taken, Brexit would remain a puzzle unresolved? Even by the standards set by the travelling clown rodeo it has become, this is beyond ludicrous. Its handling has become a national humiliation for the UK - and the UK, Ireland and the EU all deserve better. More worryingly, as each day passes, the UK appears to be moving inexorably towards a crash-out. There is as yet no plan, little prospect of finding one, and only the longest odds on agreement at Westminster. Given the evaporation of any sense of political responsibility in London, European Council President Donald Tusk had no choice but to put his foot down over Theresa May's request for a further three-month delay, without demanding something in return. A stay could be granted; but only if MPs back a deal, Mr Tusk declared. The council has acted not out of what would be an understandable sense of dudgeon, but because the clock ran out. Why should the decision-making of the entire bloc, with so many livelihoods and businesses on the line, be turned inside out to indulge the most shamelessly frivolous political posturing the Commons has ever countenanced? The marathon game of brinkmanship at Westminster could end in sinkmanship without a decisive move. Unfortunately, imposing any kind of order or marshalling any kind of consensus looks increasingly beyond Mrs May. 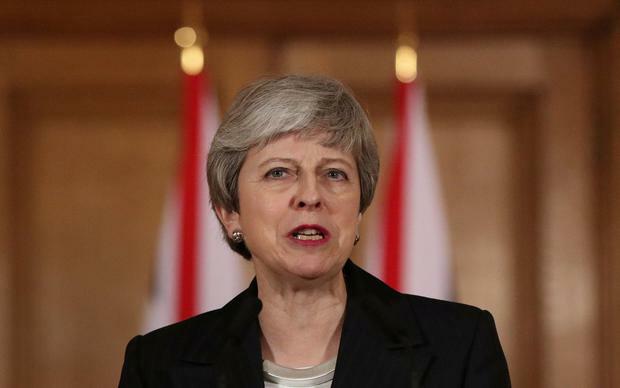 Indeed, if a managed Brexit is tied to her survival, it could be doomed, judging by the rancour and open dissent reported within her cabinet. So with no sign of authority coming from Downing Street, the EU has sought to impose its own. Inevitably, given her narrow choices and rigidity, the British prime minister finds herself savaged on all sides. Her policy of manacling herself to the blinkered interests of extreme elements in her party on one side, while at the same time bending backwards to please the DUP, has found her falling flat on her face. Berating MPs for their indecision is akin to kicking the cat. She has made herself largely redundant to results. There are now no good options. Today, Jeremy Corbyn travels to Brussels to meet the EU's chief negotiator Michel Barnier. One senses a game-changer is essential if the deadlock is to be broken. By any reckoning, Mrs May lost her grip. The party she staked all on salvaging is devouring itself. She now appears out of time, out of authority and may very soon be out of office. As European Commission President Jean-Claude Juncker explained: "As long as we don't know what Britain could say yes to, we can't reach a decision." But it should never have come to this. If there ever was an outline for the Brexit jigsaw, Theresa May seems to have lost the lid of the box some time back. And with so many of the pieces missing, it is difficult to be anything but anxious about outcomes.